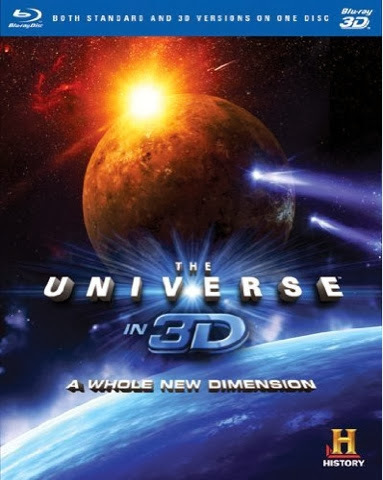 GenreOnline.net: The Universe In 3D: A Whole New Dimension Blu-ray 3D and Blu-ray Combo Disc Review. The Universe In 3D: A Whole New Dimension Blu-ray 3D and Blu-ray Combo Disc Review. The Universe is one of my favorite continuing series on History. I used to watch it with a notebook and pen at my side to take notes because the show is filled with knowledge that I like to think of as gold. However I cut the cord on cable a long time ago with the exception of high speed internet because that is now a necessity in life just like having a telephone. As streaming TV has become more popular between popular devices like ROKU and Apple TV as well as smart HDTVs in general, consumers are no longer as dependent upon cable TV. Yet despite these choices, Blu-ray Disc is still the best way to view high definition content in the home and the addition of Blu-ray 3D as a screening option adds an entirely new viewing experience that you cannot get anywhere else. Lionsgate Home Entertainment's The Universe In 3D: A Whole New Dimension presents three fantastic episodes of the popular series in both 2D and Blu-ray 3D on one dual layered MVC encoded full resolution L/R Eye 1080p/24fps 16 by 9 widescreen (1.78:1) aspect ratio presentation and the image quality for these episodes are simply fantastic. An enveloping English DTS-HD MA 5.1 Surround Soundtrack is also included complete with a DTS-HD MA 5.1 Channel calibration program to test speaker placement and performance. English Subtitles for the Deaf and Hearing Impaired and Spanish Language Subtitles are also encoded onto the Blu-ray Disc as options. The three episodes are all from 2011 and cover the diverse topics like the realities and dangers of a human piloted mission to Mars and the discoveries that may be awaiting scientists there. This episode covers the necessity of recycling everything for survival on Mars, including feces as a means of lining a space between the inner wall and hull of a pressure tight rover to protect the astronauts inside from radiation. Feces absorbs dangerous forms of radiation released by solar flares, which the planet Mars offers no defense against because it lost it's protect magnetic layer of atmosphere long ago. The next episode covers the seven worst days on planet Earth, which include a planetary collision that formed our moon, a super volcano that caused a mass extinction on such a scale it is referred to as The Great Death and the bacterial cause for an ice age long ago. The final episode covers the mystery and points of view shared between physicists and theologians on whether or not the creation of the universe proves the existence of a creator or can be explained away by the laws of physics. The episodes can be viewed individually or via a "Play All" option regardless if one chooses to view the episodes in 3D or 2D. There are no directly related extra value features outside of trailers for the upcoming History movie Houdini, starring Adrien Brody, Big History, narrated by Bryan Cranston, Ancient Aliens as well as trailers for sci-fi films available on Blu-ray from Lionsgate that include The Darkest Day and Knowing. The Blu-ray interactive menus are well rendered and easy to navigate. The Universe In 3D: A Whole New Dimension is available on Blu-ray 3D/Blu-ray Combo Disc now at retailers on and offline courtesy of Lionsgate Home Entertainment.